There are a lot of women who do not feel worthy of God due to their past, especially if the past involved sexual sin. Remember that Saints are sinners with a past. You can repent and you can find forgiveness. Pray this prayer if you struggle with the memory of your past sins. St. Mary Magdalene, thou didst come with springing tears to the spring of mercy, Christ; from Him thy burning thirst was abundantly refreshed, through Him thy sins were forgiven; by Him thy bitter sorrow was consoled. My dearest lady, well thou knowest by thine own life how a sinful soul can be reconciled with its creator, what counsel a soul in misery needs, what medicine will restore the sick to health. It is enough for us to understand, dear friend of God, to whom were many sins forgiven, because she loved much. Most blessed lady, I who am the most evil and sinful of men do not recall thy sins as a reproach, but call upon the boundless mercy by which they were blotted out. This is my reassurance, so that I do not despair; this is my longing, so that I shall not perish. Therefore, since thou art now with the chosen because thou art beloved and are beloved because thou art chosen of God, I, in my misery, pray to thee in bliss; in my darkness, I ask for light; in my sins, redemption; impure, I ask for purity. Recall in loving kindness what thou used to be, how much thou didst need mercy, and seek for me that same forgiving love that thou didst receive when thou wert wanting it. Ask urgently that I may have the love that pierces the heart; tears that are humble; desire for the homeland of Heaven; impatience with this earthly exile; searing repentance; and a dread of torments in eternity. Turn to my good that ready access that thou once didst have and still doth have to the spring of mercy. Draw me to Him where I may wash away my sins; bring me to Him Who can slake my thirst; pour over me those waters that will make my dry places fresh. Thou wilt not find it hard to gain all thou doth desire from so loving and so kind a Lord, Who is alive and reigns and is thy friend. For who can tell, beloved and blest of God, with what kind familiarity and familiar kindness He Himself didst reply on thy behalf to the calumnies of those who were against thee? How He didst defend thee, when the proud Pharisee was indignant, how He didst excuse thee, when thy sister didst complain, how highly He didst praise thy deed, when Judas didst begrudge it. And, more than all this, what can I say, how can I find words to tell, about the burning love with which thou didst seek Him, weeping at the sepulchre, and wept for Him in thy seeking? How He cameth, who can say how or with what kindness, to comfort thee, and madest thee burn with love still more; how He didst hide from thee when thou didst want to see Him, and showed Himself when thou didst not think to see Him; how He was there all the time thou didst seek Him, and how He didst seek thee when, seeking Him, thou didst weep. 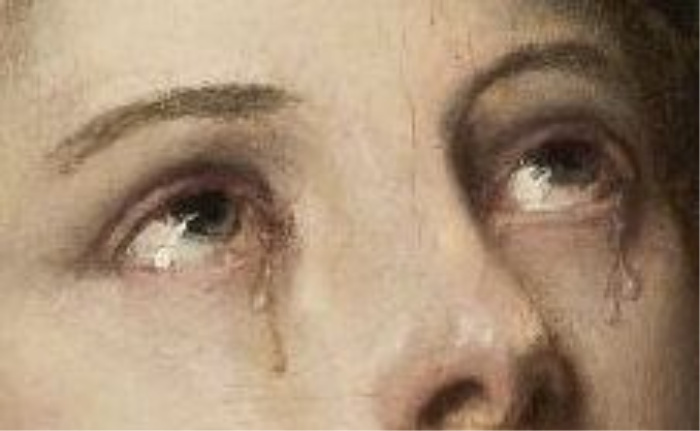 But Thou, most holy Lord, why didst Thou ask her why she weeps? Surely Thou canst see her heart, the dear life of her soul, is cruelly slain. Thou didst hang on the wood, pierced by iron nails, stretched out like a thief for the mockery of wicked men; and yet, ‘Woman,’ Thou didst say, ‘why art thou weeping?’ She had not been able to prevent them from killing Thee, but at least she longed to keep Thy Body for a while with ointments lest it decay. No longer able to speak with Thee living, at least she could mourn for Thee dead. So, near to death and hating her own life, she repeats in broken tones the words of life which she had heard from the living. And now, besides all this, even the Body which she was glad, in a way, to have kept, she believes to have gone. Had she not reason to weep? For she had seen with her own eyes—if she could bear to look—what cruel men cruelly did to Thee; and now all that was left of Thee from their hands she thinks she has lost. All hope of Thee has fled, for now she has not even Thy lifeless Body to remind her of Thee. Thou, her sole joy, should be the last thus to increase her sorrow. But Thou knowest it all well, and thus Thou didst wish it to be, for only in such broken words and sighs can she convey a cause of grief as great as hers. The love Thou hast inspired Thou didst not ignore. And indeed Thou knowest her well, the gardener, Who planted her soul in His garden. What Thou plantest, I think Thou doth also water. Does Thou water, I wonder, or does Thou test her? In fact, Thou art both watering and putting to the test. But now, good Lord, gentle Master, look upon Thy faithful servant and disciple, so lately redeemed by Thy Blood, and see how she burneth with anxiety, desiring Thee, searching all round, questioning, and what she longest for is nowhere found. Nothing she seest canst satisfy her, since Thou Whom alone she wouldst behold, she seest not. How long will my Lord leave His beloved to suffer thus? Have Thou put off compassion now Thou hast put on incorruption? Did Thou let go of goodness when Thou didst lay hold of immortality? Let it not be so, Lord. Thou will not despise us mortals now Thou hast made Thyself immortal, for Thou didst make Thyself a mortal in order to give us immortality.And so it is; for love’s sake He canst not bear her grief for long or go on hiding Himself. For the sweetness of love He showeth Himself Who would not for the bitterness of tears. The Lord calls His servant by the name she hast often heard and the servant doth know the voice of her own Lord. I think, or rather I am sure, that she responded to the gentle tone with which He wat accustomed to call, ‘Mary’. What joy filled that voice, so gentle and full of love. But in truth, Thou Who art very truth, Thou knowest me well and canst testify that I write this for the love of Thy love, my Lord, my most dear Jesus. I want Thy love to burn in me as Thou commandest so that I may desire to love Thee alone and sacrifice to Thee a troubled spirit, ‘a broken and a contrite heart’. Hear me, for Thy love, and for the dear merits of Thy beloved Mary, and Thy blessed Mother, the greater Mary. Redeemer, my good Jesus, do not despise the prayers of one who hast sinned against Thee but strengthen the efforts of a weakling that loves Thee. Shakest my heart out of its indolence, Lord, and in the ardour of Thy love bringest me to the everlasting sight of Thy glory where with the Father and the Holy Spirit Thou livest and reignest, God, for ever. Rigorous Lent L009: Are You Spitting in Our Lord’s Face?